tl;dr: there's a new review queue. It'll be getting somewhere around 1-2 questions per minute. The only thing they have in common is that the system is unsure of what to do with them. Some are great, some are awful, some are in-between. We need you to help the system decide which category these questions belong in. If this works, we'll be building a whole lot more stuff on top of it: better questions on the home page, more help for promising users, less of a close-queue backlog... So let's test it! Stack Overflow gets a huge number of questions per day. The best get answered. The worst get closed and deleted. However, there are a huge number of questions that aren't bad enough to be removed but... still aren't great. Many of these still get answered, and could be turned into exemplary questions... if anyone cared enough to fix them. But whether or not they get answered or edited is largely a matter of luck. In fact, luck has become entirely too much of a factor for even well-asked questions - the volume is too great to easily sort through, and many users depend on either the homepage's automatic filtering or complicated tag filters. Those that will likely be well-received by the community and obtain answers with no further structured review. Those that will likely be poorly-received by the community, closed or deleted regardless of how much assistance they’re given. Those for which additional guidance or revision might result in a positive reception and useful answers. However, first we need to make sure that works! In particular, before we start filtering questions from the home page or building a queue for helpful editors, we need to make sure the two pieces we've built already actually do what they're intended to. If it looks like things are working, we'll start dropping questions that don't "Look OK" from the home page. If it's not working, we'll fix them. Change the guidance, the number of reviews required to complete a task, etc. Once we're all happy with both the behavior of Triage and the appearance of the home page, we'll roll out a Helper/Editor workflow. Go, review, & let us know how it works! When an item is marked as needs improvement and gets edited, it should go back to triage, not to the homepage. Since Triage is effectively how the VLQ flags will be handled for questions, the VLQ flag on an item currently sitting in "needs improvement" shouldn't push it back to Triage. It should just do nothing, since it's already in the queue that handles those flags. It shouldn't push it out of the needs improvement queue. It'd be nice to be able to see, when viewing a question, if it's in the triage queue, and any past Triage actions taken on it. It doesn't need to be prominent (perhaps as entries in the revision history? ), and it should likely have some sort of rep requirement, but it'd be nice to see. It's unclear to me what the cutoff point or difference is between "Should Be Improved" and "Unsalvageable". When I think something should be improved, usually it's because there's an applicable close reason. However, the close reasons are located under "Unsalvageable". Right now, "Should Be Improved" isn't clear on who should be doing the improving. An editor? Then there should be an edit button. The author? Then there should be close reasons as well as comments to guide the improvement. "Unsalvageable" should also include close reasons, since some "questions", such as "give me teh codez", can't be improved, but it shouldn't be the only route to the close vote option. Another option is to break out the choices into a few more buttons that have clearer instructions. This separates closing questions because they can be improved by the author from truly bad questions that we all know are inappropriate for the site. "Good Enough", "Needs Editing by Anyone", "Close, Author Needs to Edit", and "Unsalvageable, Should Be Deleted". The upvote dialog is just nonsense; it should be removed. What's the rationale about "we strongly encourage you to upvote it"? Just because a question meets the site's standards, it doesn't necessarily mean it is a good question. Furthermore, it is very likely that the reviewer lacks the technical knowledge needed to determine whether the question is good or not, because they don't understand the actual content. 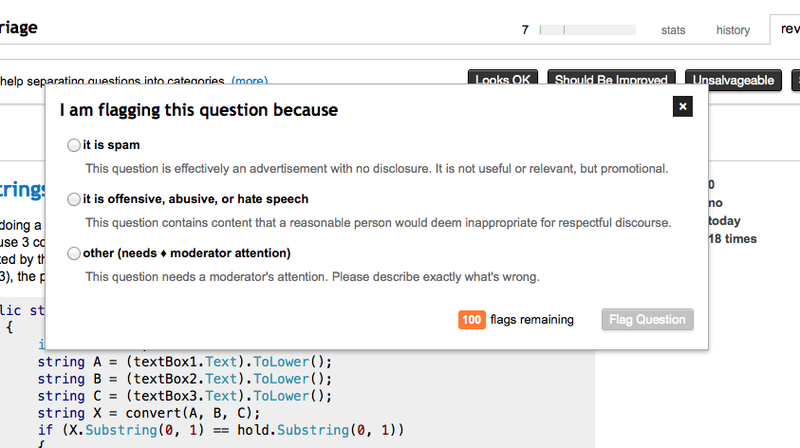 Stack Overflow is a Q&A site about programming, not about rhetoric. To receive an upvote, a post should meet the site's standards and contain good technical content, which gets the upvoting individual curious and interested and/or benefits the community as whole. In particular, questions that seem unique and have not been asked many times before deserve upvotes. This upvote dialog also kind of suggests that "we are so used at horribly poor questions on this site, that if you come across something of mediocre or above quality, immediately upvote it no matter the contents!" Given that the questions in this queue are in that murky area of "not sure if it's a bad question or not", then I would think that only users who have good knowledge of the question's field will be able to make a call. So, can the queue be filtered so that we only see questions that have a tag matching one of our favourites? Otherwise users will (should) be hitting the Skip button most of the time. Not having seen the "Needs Improvement" queue, this request may already have been taken care of. However, my very first review in this queue was a "Needs Improvement" question, but not one that can be fixed by an external editor. In this case, as in many Stack Overflow questions, the requisite code was missing. The problem statement was clear, and the scope narrow, just this one (very important) piece of information is missing! An external editor can't add it, and I couldn't add a comment. Could we allow comments, or perhaps a pro-forma one like that in VLQ ("Your post needs improvement, your question will not get visibility until you...") or something like that? I get that we are trying to triage quickly but if the focus is on other users editing in the "Needs Improvement" queue, I can see many questions being stuck in limbo. Also, the "Unsalvageable" guidance seems a bit off. Closing a question just means it needs a lot of improvement, not that it can't be salvaged at all (unless we are lying to ourselves about the whole "On Hold" thing). Without the ability to comment, a user who wishes to VTC will likely cause the question to be closed without ever getting a "You need to do..." comment (since it wouldn't hit the NI queue). The "Unsalvageable" button seems to work exactly like the normal "flag" link on the post itself. If you have a review item open and it has already been closed by the time you get to choosing "Unsalvageable", you get the flag dialog minus the close options. The same thing, with the addition of the VLQ option, appears if I myself have already voted to close outside the queue. This has already been handled/closed. If more needs to be done, visit the post and flag it. Similar to what happens when you finish a suggested edit review too late. Presenting the dialog lacking the option to do what I'd typically do in this queue, without explanation, is confusing. I am missing the "edit" & "leave a comment" buttons in particular. Often posts are okay, except that the code isn't in a code block. This is so easily fixed and there's almost never a reason not to do it when you spot it. This is often all that's needed before it "Looks OK". Similarly, leaving a comment is often useful; half the time this can be as simple "We can't debug code we don't see, you need to post your code :-)"; why not just leave a comment when you're at the question anyway? 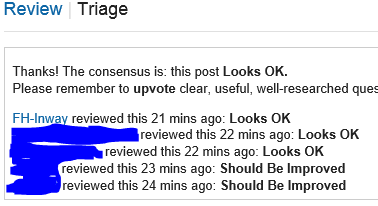 I know this is probably not what "Triage" is intended for, but I already spent time reading & comprehending the question, so why not immediatly add a simple comment with a suggestion on how to improve it while you're here anyway, instead of having someone else read & comprehend the question again? But in general, looks cool :-) Looking forwards to the results. As things stand, I'd be willing to wager that this experiment will fail miserably. Primarily for four reasons. First and foremost, a pig with lipstick is still a pig. Users don't like reading SO's front page once they've decided it's an ocean of trash. I'm therefor at a loss as to why they'd suddenly want to go through the very worst of the trash they're actively avoiding, for the mere reason that it's presented in a slightly different format -- and without the appeasing satisfaction of rabidly casting down-votes to boot. Secondly, and as a result of the this, potential reviewers have absolutely no incentive to dive in this cesspool. Thirdly, it's evident in the queue's history that quality standards are very different from one reviewer to the next. Some questions, which I'd rate as objectively "Get out of my face" unsalvageable, apparently look OK for other reviewers. Lastly, and in stark contrast with the low quality post queue where mindlessly closing typically is the obviously correct answer (even when you know next to nothing of what's being asked), these questions often need to be read, and sometimes even understood, in order to make an educated assessment of how bad they are. This last reason is easy enough to fix: only show posts tagged with either of one of the reviewer's favorite tags or one of the tags in which the reviewer has a bronze badge. With respect to the second and third reasons, I'd like to suggest that any "Unsalvageable" or "Needs improvement" vote cast on a question that ultimately gets published as "Looks OK" without modifications should automatically count as a down-vote. If that is not acceptable, than at the very least give the opportunity to cast a downvote then and there. If it is acceptable, a further incentive to make reviewers exhaust their review quotas would be to make it so that this downvote does not count against daily vote limits. With respect to the first reason, much more must to be done in order to ensure that posters don't flood the site with junk to begin with imho, so as to stop the trash at the city gates rather than in the town center when it's all over your face. In the flow chart, I believe extra steps are needed prior to new questions getting sent to the queue. The point would be to make it impeccably clear upfront that a question will not even get published, let alone answered, if it is too low quality. Your question raised too many low qualify flags. Left as is, it will not even be reviewed for consideration. Please take some time to review our guides on writing a good question if you haven't done so already, and amend your question accordingly. It doesn't matter of there are false positives here. Authors of good questions with a very low score will expand on theirs a bit more and move on with their day. What matters is catching as many genuine positives as possible; this "very low score" needs to be high enough that posters of undesirable questions find it user hostile. Your question raised several of our low quality flags. If you leave things as is and re-submit this form, the question will be pushed to a triage queue. The triage queue is where reviewers will decide whether you question fits our quality standards or not. 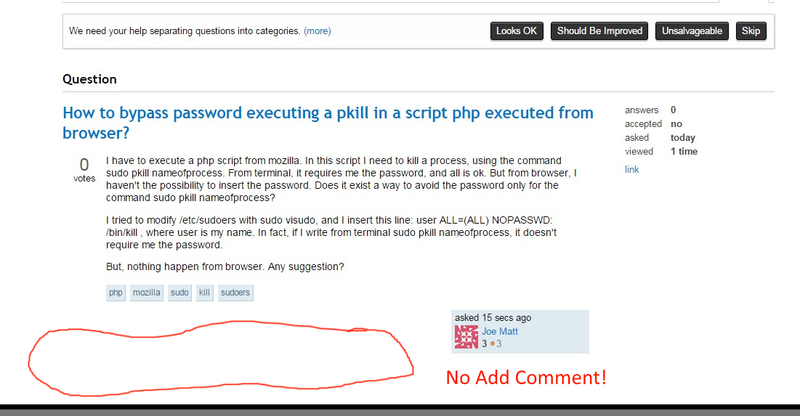 When not, they may prompt you to improve your question or delete it outright, before it even appears on the site. Before re-submitting this form, please take some time to review our guides on writing a good question if you haven't done so already, and amend your question if you feel it is necessary. In each case, and perhaps for all questions or for some other set of rather low quality questions, the submission form should change from freeform to structured. After doing a few reviews and observing the queue, it looks like the label "unsalvageable" is being confused with the VLQ flag's terminology of salvaging. Can it be renamed to something which doesn't coincide with any pre-existing term on the site, like "Needs moderation"? First, I hope this experiment works out well. How should we handle questions that belong at another SE site? "Unsalvageable" (apparently?) puts the question into a mod queue, which creates useless work. "Needs improvement" and "looks OK" trigger the wrong flow. I'm marking them unsalvageable and closing them as "belongs elsewhere"; I hope that triggers the right flow. Also, and this is quite minor: Can you make the "Unsalvageable" -> "wrong site" flow fewer clicks long? "Needs improvement" seems to cast a pretty wide net. Should I use it for questions that are slightly ambiguous but may be answerable? Should I use it for questions that appear to have the kernel of an interesting question buried inside a mountain of crap, or do those get whacked with "unsalvageable"? I recognise that it will be very, very hard to articulate a set of general guidelines that actually separate the lower fringes of "looks OK" from "needs improvement" and the lower fringes of "needs improvement" from "unsalvageable," but I've never gotten text classification to do anything useful without rigorously defining categories. I also recognise that defining categories based on something other than how crappy a given question is might lead to useless results. What should I do with poorly-researched questions? I think these queue items should require more reviewers. When I tried it out, I found there were a number of questions where I wasn't sure which category to put them in. Optimism can be the difference between NI and U, and pessimism the difference between LO and NI. The one that I saw the results on passed with 3 "Looks OK"s and 2 "Needs Improvement"s. I guess it was questionable whether it was actually OK or not. If it had been 3 "Needs Improvement"s and 2 "Unsalvageable"s, those people would have got their flags disputed as well. It just seems to me that, since these are already unclear/borderline questions (albeit as decided by the system), it would be better to have more pairs of eyes on it. You keep saying that the whole point of this queue is for it to be really fast, right? I think that since it's a fast queue you could require twice as many reviewers and not have it be a problem. Edit: I've now seen 4-5 questions where I was the last vote on them and they all had 3:2 results. This has made me more sure that 5 reviewers is not enough for what are essentially already borderline questions. Since triage queue was introduced, it looks like close queue started stronger prioritizing for certain kind questions. Top of the queue (items presented first to reviewer) seems to be much more filled with questions that are: 1) clear cut close-worthy, 2) recent (often posted within 1-2 hours) and 3) not yet answered. Above was observed with my favorite filter setting (too broad). I also briefly tested this with filters off, the effect appears to be present there too but it was just less comfortable so I quickly dropped back to filtered review. To me this change is beneficial, because mentioned priorities fit my own review preferences. As a result, I skip much less than before. For reviewers with different preferences (eg older questions, or trickier cases etc), this may mean they would have to skip more to get to lower priority queue items. It's not listed under the privilege that unlocks late answers and first post queues nor that for suggested edits and very low quality queues. (If it is at the edit privilege, that privilege should probably be split, since it is summarized as "edit" but is actually "edit and also access 3 new review queues). Sorry, if it's been already reported or if you decided to redesign the dialog. Something to consider (not necessarily pitching it as a good idea) is allowing us to manually enter into the triage a specific question - much like how we can with close votes, as well as seeing pending edits. This is mainly because we can do it for every other existing queue. Close votes and flags are both absolute votes for closing something. The On Hold system tried to remedy this but alas it ended up being a comfort blanket instead of a real solution. In order for the Triage queue to be this solution, I feel like we should be able to manually place questions into the triage queue in order to give them a second chance. 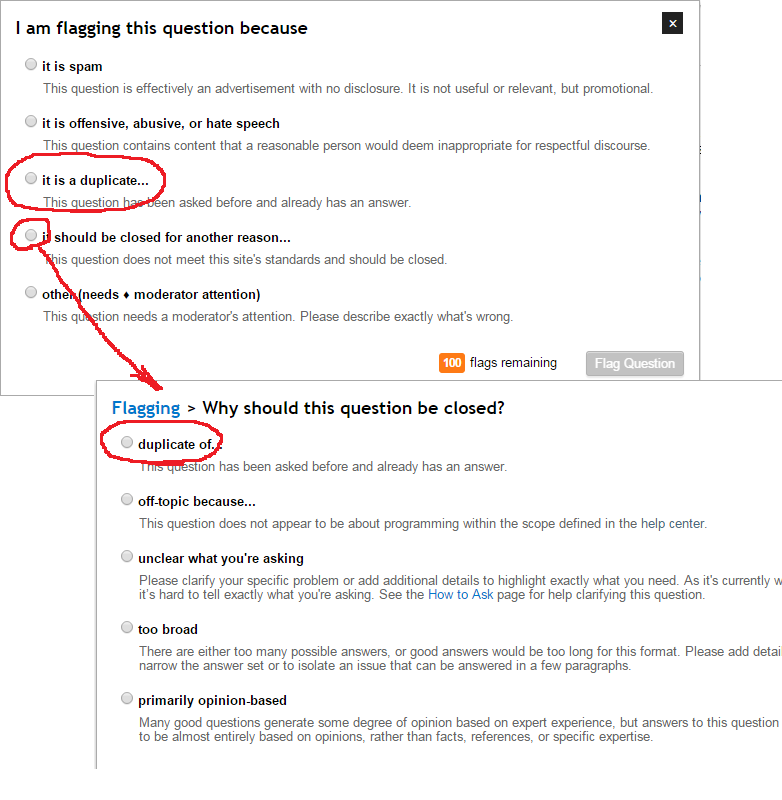 For instance, a user posts a question that may be able to be salvaged; instead of voting to close and instantly discouraging them, as a user, I would be able to enter into the Triage their question (with an initial vote to improve) and give them a chance to not only save their question but to see how an external editor would have asked it. To me, that would be a much better lesson in how to work the site - especially since this is a trial run for a potential replacement of current queues on the site. I have found a couple of weird things in this queue. In the history page, specifically. After reviewing a few questions, I wanted to compare my decissions with the rest of the reviewers'... to make sure that I'm doing it well. So I've clicked on History and opened one of the review links... such as https://stackoverflow.com/review/triage/6383238. I don't know how these are called, I'm going to refer to them as "review pages". For that particular question, I'm the one who made the final vote, so I was presented with the "vote up" dialog (which I did, because it looked like an interesting question, and I was strongly encouraged to do so :). Now, when I open the "review page", the "vote up" button is enabled again, and if pressed, it removes the upvote. Shouldn't it be disabled if I already used it, instead of behaving exactly like the up arrow? For questions that I skipped, and which are still in the queue (i.e. no consensus reached), the "review page" shows the review buttons again (looks OK, should be improved...). I did not try, but I guess it would allow me to vote. It shoudln't behave that way, I already skipped the review because I didn't know what to do with that question. Wouldn't it be better to show the other reviewers' actions? It's what it does once the review is complete (consensus has ben reached). Other than that... I also miss the "Edit" button, as many people already stated. "Should be improved" is ok, but it would be better if we had also the option "Can be improved, let me do it". Triage offers a great variety of options of categorizing unsalvageable posts. I think it would be a great help to get some kind of feedback after the community decided on the fate of a post. Simply color-coding the review audits where the community disagreed with my decision or my suggested reason for closing would be helpful to learn from mistakes and misconceptions and thus improve future audits. Why am I taken to a "Thanks" dialog when I'm the third person to submit Looks OK? I appreciate that I'm being thanked, but if I'm to be thanked then so should everyone else who voted (without having to manually get back to the review). I feel this dialog is a bit unnecessary, and would rather just be taken straight to the next review. Some discussion in the comments of Triage gray areas - what should we do when the question is borderline? between me and gnat seems to have extracted that the three buttons may be incidentally making it more difficult to reach consensus. A proposed option of having two separate triages might be possible. Posts that reach consensus on Look Okay are cleared. Posts that reach consensus on not looking okay are sent to Triage 2. Triage 2 - Needs Improvement vs Unsalvageable. This allows for more users to get their opinions on a single question, and establishes the precedent early on whether something is wrong with a post. Then, a post with a high Skip count would be indicative that a post seems to be in a gray area in Triage 2. A Skip in the current system doesn't indicate very much as it could be bordering between Okay and NI, or NI and UN. This is quite annoying (it's like <marquee> and <blink>!). Can it be removed? At first, I thought that this wasn't the best idea. But the thought of using this to improve the site at least made me not hate it. Then, I started doing some spot-checks on what people thought "looked OK". Now I'm worried. Bear in mind that I'm not picking on any of the askers here. For example, this question. If anyone had looked around a bit, they would have observed that it was a pretty straightforward duplicate of this question. And yet, it's been marked "Looks OK". So this is what scares me a little bit about the system. If we rely on people that don't really take the time to review this to improve the algorithm, we're not going to get much improvement out of it. That said, I'd recommend/encourage that the algorithm evaluate a user's participation within that tag, or overall reputation, before they take these evaluations seriously. Or, better yet, if the question is found to be of poor quality anyway due to it being closed, deleted, or otherwise disapproved upon by the community, those points of data shouldn't count. The idea is to remove garbage from the site. Let's make sure it stays removed. Users with access to VLQ queue, should not put the VLQ flag, this adds an extra step in the process of deletion (or not) of the question. 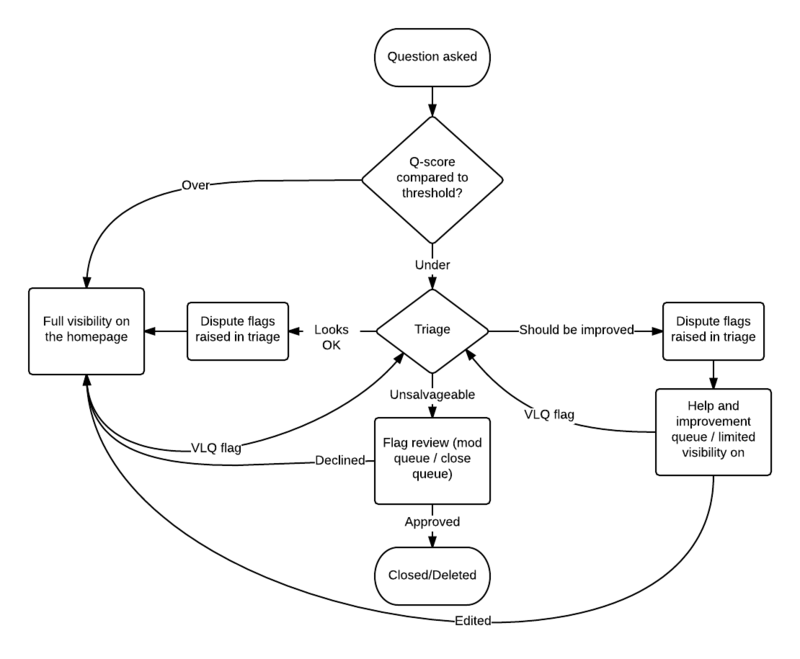 If the user is trusted to put a more accurate flag, it seems more expedient to be done directly on the Triage queue. I did my first rounds of reviewing today and triaged about a dozen or so. I came here to meta because I was unhappy with not being able to say "don't know". And that was because I work with a 1200x1980 monitor (that is: 1200 wide) where the screen ends before the "Skip" button. I only recognized there was such a thing as skipping when I saw the screenshot in the question on the present page. Please rethink the web design in this respect. I'm wondering if "Looks OK" should need a majority of three votes instead of only an absolute of three votes. It is in my experience rare that you will only see three "Looks OK" votes there. I guess worst case would be two votes "Unsalvagable", two votes "Should Be Improved" and three votes "Looks OK". The question will go to the homepage although only the minority of voters think that the question is ok. So I'm wondering if the triage quality could be improved by requiring the "Looks OK" votes to have a majority of three votes over all other votes. In my example that would mean two more "Looks OK" votes. I decided to explore this thought a bit further and get to know SEDE in the process. The result of this exploration is Triage Review Decisiveness. As suspected, a decisive result where one option has 3 more votes as the other options combined is more the exception than the norm. The percentage of indecisive results seems to hover around 70% for all three options. As a side result, surprisingly (for me), the "Should Be Improved" option seems to be slightly less favored than "Looks OK". Originally I also wanted to weigh the votes by the reputation of the user, but I found no way to get the user for a review result. When you triage a question it's text will be greyed out while the system looks for a possible next question. The text will briefly flash back into non-greyed before being deleted if there is no next item to review. If there is a next item to review and the internet (or SO servers) are fast in responding, I never noticed anything, but today the internet seems slow and the old message gets presented, with the refreshed header, only to be replaced after 1-3 seconds by the text of the new question to triage. The latter is quite confusing. You probably can fix this by completely removing the innerHTML of the greyed out text before starting to load the next page (in both cases: new Q for triage available or not available). Not the answer you're looking for? Browse other questions tagged discussion review se-quality-project triage . What causes you to abandon an edit? How do active answerers find questions to answer? How should you triage bad but clear and answerable questions? Where do the Posts in Triage Section of the Reviews come from? Where do the Triage trick questions come from?